Thirty years ago, in arguably the best performance on Christmas Day in league history, King scored 60 points in the Knicks' 120-114 loss to the Nets. Bernard King played 14 seasons in the NBA and was inducted into the Hall of Fame in September 2013. Thirty years ago, in arguably the best performance on Christmas Day in league history, King scored 60 points in the New York Knicks' 120-114 loss to the New Jersey Nets. King recounted that legendary night with SI.com. During the 1984-85 season, I was in the heart of my prime. The previous year, I had registered back-to-back 50-point games. As we prepared to play the Nets on Christmas Day in 1984, I was leading the league in scoring. Our team was dealing with injuries, so I knew I was going to have to provide greater production than usual. It was an exciting time to play on Christmas Day. There weren’t five games on the schedule like today. We were the sole attraction. You knew all your peers and the basketball world was watching. My trip to the arena that day was the same as it always was. I’m from Brooklyn, and I’m playing in Madison Square Garden. I’m living out my dreams. For me, it was a different feeling than any of my teammates had because I was from New York and I was representing my hometown. I’m playing in an arena where my basketball heroes played, where I walked past as a kid. So when I drove to the Garden from my home in Brooklyn, I always had goose bumps. I always felt that feeling when I put on my jersey and walked out on that floor. It was special. Every game at Madison Square Garden was Christmas. Playing at home, I’m representing the organization and the city, and for me it was a different mindset than that of my teammates. I was the one carrying the pressure. If I didn’t play well, then we didn’t play well. One of the things that I’m most proud of is that I was never booed at Madison Square Garden. The fans recognized that when I stepped on that court, I didn’t save anything. I got off to a great start in that game against the Nets and felt great. I could recognize and feel all the spacing on the floor, the seams in the defense. I didn’t have to think about it. I scored 40 points in the opening two quarters, the greatest first half I ever played in my career. 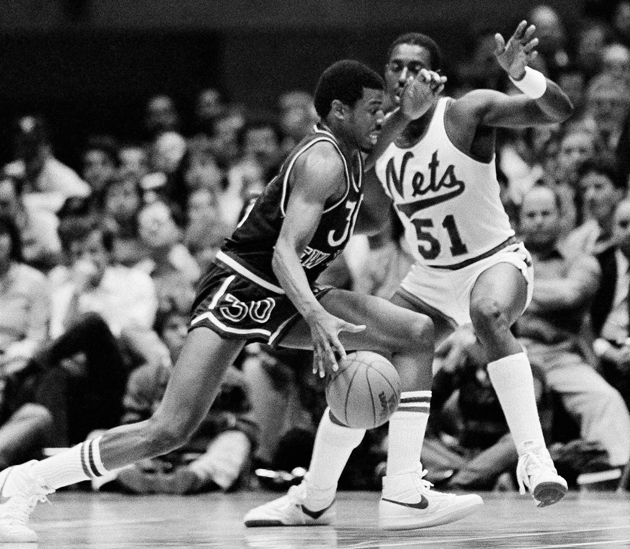 ​Nets coach Stan Albeck put several different defenders on me, including Buck Williams and Micheal Ray Richardson. What I did in the game was something I always referred to as “the artistry of scoring to win.” I never talked about it when I played because I didn’t want anyone to know what I was doing. One of the things I’d do is shoot strictly from nine distinct areas on each side of the floor, along with four spots in the middle. And since I knew there were only five ways a player can be defended on the wing, all I had to do was develop five moves to offset the different ways you could defend me, because you have to give me one. Then, I’m going to one of those nine spots to take my shot. My favorite shot, and what I’m best known for, was the baseline jumper. Whether I scored 15 points or 60 in a game, the bottom line was: Did we win? Scoring 60 points may take on an added flavor, especially after many years because it's still so memorable for so many people, but in that moment I felt total dejection. There was no excitement. What bothered me most is that we didn't get a win for the fans. Every year people talk to me about my 60-point performance. Last year, in particular, was pretty cool. Spike Lee called and let me know that he’d be doing a commercial to run during all the games in which he’d be talking about my performance. When the fans perceive that an accomplishment is tremendous, it takes on even greater meaning when it stands the test of time. The 60-point game was a Madison Square Garden record that stood for 30 years. Richie Guerin’s record, which I broke by three points, had stood for 30 years. So it’s very meaningful to have a record that held up for so long. It’s funny, every Christmas I want to get on the court! I always watch all of the games, and this year we have a tremendous lineup with so many great players. The biggest thing for me is that I want to watch great teams and great players. What is it like to play in an NBA game on Christmas Day? It’s a celebratory time of year and you’ll see that in the players. You’re going to see extra pep in their step. They all want to have a great game. The world is watching.